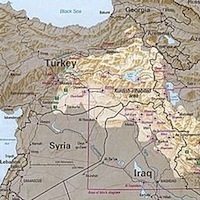 Home » Arsenal Research » Iraqi Kurdish PM calls for Sunni autonomy; Will Kurds leave Iraq? Iraqi Kurdish PM calls for Sunni autonomy; Will Kurds leave Iraq? Map (CIA): Ethnically Kurdish zones of Turkey, Iraq, Syria, and Iran. What a turn of events. Once carved out with Western support, contrary to Turkey’s wishes, against genocidal oppression by the Sunni-led minority regime in Iraq, the autonomous Kurdistan Region now sits as the Turkish-backed power player in the future of Iraq during the current crisis. And for the moment it appears to be more sympathetic to the Sunnis than anyone else (while earning global brownie points for graciously sheltering a massive influx of Sunni Arab refugees). In an interview with the BBC (video), the prime minister of the Kurdish Regional Government, Nechirvan Barzani, said that it will be “almost impossible” for Iraq to go back to the way things were before the fall of Mosul to ISIS. The KRG is now describing everything as pre-Mosul or post-Mosul, like the clock of history got reset last week. Barzani also very pointedly said that he will not order the Kurdish Peshmerga paramilitary — some of the best troops in the country — to help retake Mosul or any other city on behalf of the Shia-led central government. He did not however comment one way or the other on the possibility of taking the cities permanently and unilaterally for Kurdistan. I’d been speculating that perhaps the Peshmerga would “liberate” Mosul and Kirkuk, both historically Kurdish cities with large oil fields, from ISIS (and the Arabs more broadly), to reclaim them for the region, which would facilitate full independence. Kirkuk, the political and religious ex-capital, apparently fell into Peshmerga hands last Friday. The Kurdish Regional Government (KRG) asserts that the central government’s prime minister authorized them to take control of the local Iraqi Army headquarters in Kirkuk and provide security to the city as the Iraqi Army was disintegrating in the north. In another extremely curious turn of events, Turkey, a country long fanatically opposed to an independent Kurdish state even in Iraq due to its own Kurdish separatist movement, seems to have warmed to the possibility of full independence next door in recent years. The party spokesman for the ruling AKP in Turkey, allegedly (according to CNN Turkey, based off incomplete quotes) recently made remarks to an Iraqi Kurdish media outlet indicating that Turkey would now be willing to back the creation of a hypothetical independent Kurdistan in Iraq. Turkey has been forming closer ties than ever with the KRG, facilitating oil exports without Iraqi central oversight (the KRG strenuously disputed the Bloomberg Businessweek reporting on the story and faulted Iraq’s government for allegedly withholding royalties), and providing a financial bailout for the regional government. For their part, since the height of the Iraqi Civil War, the Kurdish Regional Government has been extremely careful not to align itself materially or rhetorically with the Kurdish independence movements in either Iran or Turkey. They have even toned down reactions to Turkish military operations against Turkish Kurdish rebels, even within KRG territory in Iraq, essentially giving the we-don’t-like-it-but-we’re-staying-out-of-it response that they’ve also given neighboring Iran during military counterinsurgency operations inside Iraqi Kurdistan. This cooperation (or non-support for other Kurdish separatists) proved a savvy move that allowed the KRG to befriend Turkey, a NATO member with a massive military, rather than remaining Turkey’s Foreign Threat No. 1. It also created a security buffer to place a check on how much Turkey has to absorb from its collapsing neighbors (Iraq and Syria). (Moreover, the removal of support from Iraqi Kurdistan for the insurgency in Turkey pressured many of the Kurds there to come to the negotiating table and become temporary allies with the embattled AKP Prime Minister of Turkey in his hour — or entire year 2013 — of need.) As a result of all of this, economic ties between the KRG and Turkey, including the recent oil shenanigans, have flourished and commerce is booming. Plus it’s a great way for both parties to stick it to Iraqi Prime Minister Maliki. Even the Syrian Kurdish zones in the Syrian civil war have not received much help from their Iraqi counterparts. And the long-oppressed Syrian Kurds are more or less on the same side of the Syrian conflict as Turkey’s government has been, so it would be conceivable in the new order that Turkey would accept stronger ties between the two, if they thought it would help the Syrian war effort. Right now, compared to most of Syria’s chaos and destruction, the Kurdish zones are looking pretty good. (That’s a relative description. It’s really not great.) With Assad clawing back toward victory, it remains to be seen whether Iraq’s Kurds will manage to link up with their long-oppressed Syrian counterparts, but if they did, Turkey would probably look the other way, as long as the KRG continued to maintain cooperation and didn’t resume support for Turkish separatism. At the moment, Iraqi Kurdistan has more means and a better opportunity than ever to declare independence and go it alone. Are they sufficiently motivated to seize the chance? Tagged Iraq, Iraqi Kurdistan, ISIS, Kurdish Regional Government, Kurdistan, Middle East, Syria, Syrian Kurdistan, Turkey. « What took so long? Washington NFL team loses trademark for racial slur. ISIS rolls back Kurdish forces in Iraq. What’s next?